Maintains an up-to-date view of every system network interface and notifies when an interface is added or removed. The implementation of this class is highly platform dependent, and not all platform backends provide all the features. On macOS, SystemConfiguration and CFNotificationCenterAddObserver are used (notification of MTU change is not supported). On Linux, netlink notifications from the kernel are used. See getCapabilities() for the detailed set of capabilities supported by the platform backend currently in use. Definition at line 50 of file network-monitor.hpp. NetworkMonitor is not supported and is a no-op. NetworkMonitor onInterfaceAdded and onInterfaceRemoved signals are supported. NetworkInterface onStateChanged signal is supported. NetworkInterface onMtuChanged signal is supported. NetworkInterface onAddressAdded and onAddressRemoved signals are supported. Definition at line 67 of file network-monitor.hpp. Construct instance, request enumeration of all network interfaces, and start monitoring for network state changes. Definition at line 58 of file network-monitor.cpp. Definition at line 63 of file network-monitor.cpp. Returns a bitwise OR'ed set of Capability flags supported on the current platform. Definition at line 73 of file network-monitor.cpp. Returns the NetworkInterface with the given name, or nullptr if it does not exist. 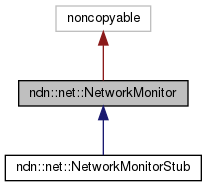 Definition at line 79 of file network-monitor.cpp. Lists all network interfaces currently available on the system. May return incomplete results if called before the onEnumerationCompleted signal has been emitted. Definition at line 85 of file network-monitor.cpp. Definition at line 103 of file network-monitor.hpp. Fires when network interfaces enumeration is complete. Definition at line 115 of file network-monitor.hpp. Fires when a new interface is added. Definition at line 118 of file network-monitor.hpp. Fires when an interface is removed. The NetworkInterface object is no longer present in the internal list of network interfaces when this signal is emitted. Definition at line 125 of file network-monitor.hpp. Definition at line 128 of file network-monitor.hpp.